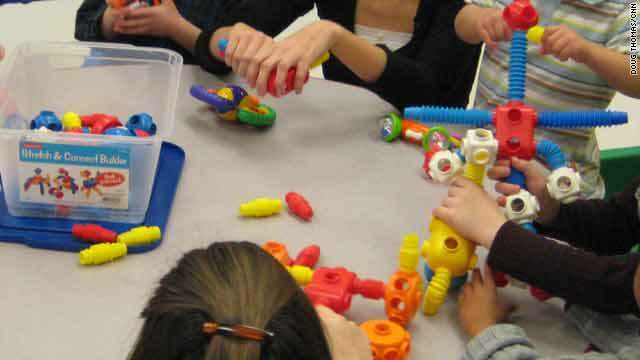 An intervention program called "Early Start Denver Model" emphasizes play therapy for very young children with autism. (CNN) -- Researchers have shown for the first time that if a child is diagnosed with autism as early as 18 months of age, offering the toddler age-appropriate, effective therapy can lead to raised IQ levels and improved language skills and behavior. "Early intervention can be very effective for toddlers with autism," says Geraldine Dawson, chief science officer of the advocacy group Autism Speaks, and one of the two lead authors of a study published Monday in the journal Pediatrics. Since 2007, pediatricians have been told to screen 18-month-old children for autism. But what the next step is when such a young child is diagnosed has not been clear. "It's crucial, if we're going to offer screening at such a young age, that we can offer an intervention, and now we know we have methods that are effective," says Dawson. She adds, "This is the first controlled trial in children under the age of two-and-a-half." While Dawson was at the University of Washington, she and co-study author Sally Rogers from the University of California-Davis M.I.N.D. Institute devised the trial involving 48 children with autism. All the children in the trial were between 1 1/2 and 2 1/2 years old at the beginning of the study. Half of the children were given community-based interventions or therapies and the other half were enrolled in a 20-hour per week intervention program called "Early Start Denver Model" (ESDM), developed by Rogers. The goal of this research was to determine how much the debilitating effects of autism can be prevented or reduced. ESDM was designed to address the needs of toddlers with autism as young as 12 months old, and it is delivered by trained therapists and their parents in a very natural setting -- the child's own home -- with children sitting on the floor and playing, rather than having a more adult-directed therapy. "It's a very pleasing kind of therapy, kids are happy. It is play, and it can happen everywhere," Rogers explains. Dawson adds that this type of intervention builds on a fun, positive relationship with the therapist. This is a contrast to traditional Applied Behavioral Analysis (ABA), which is delivered at a desk, with the child sitting next to the teacher or therapist, who breaks down complex tasks into small components and then gives tangible reinforcements. At the end of two years, all of the children showed improvements. But children in the ESDM group had increased their IQ by nearly 18 points -- 10 points higher than the children getting the standard autism therapy offered in the community. Scores for listening and understanding as well as motor skills and self-care skills were all higher in the ESDM group. "Many of the children had virtually caught up to the typical kids their age," says Dawson. Rogers says parents can pick up the ESDM therapy methods quite easily. "They can learn this within six hours of working with therapists," she says. Then parents can use the skills in everyday settings, not just during specific therapy sessions. The study's authors also noted that the children in the ESDM group required only 15 hours of weekly intervention with a therapist, compared with the usual 40 recommended hours. This can have a significant economic impact on families. In 2006, a Harvard study estimated the lifelong cost of care for person with autism is more than $3 million. Children with autism can have one of several complex neurological disorders, which lead to social impairments, communication difficulties and restrictive and repetitive behaviors. While the cause of autism in not yet known -- genetics and environmental triggers are believed to play a role -- the benefits of early intervention have been shown to reduce disruptive behaviors and teach the child skills that will lead to greater independence as he or she gets older. There is no known cure for autism. The researchers of this study are quick to point out this they didn't cure any children, either. The subjects of the study still have autism, although it may be in a milder form. In 2007, the American Academy of Pediatrics recommended that all children be screened for autism at the ages of 18 months and 24 months. A report published in their journal, Pediatrics, that year said that several studies showed that the Denver model was an effective treatment, but that "controlled studies are lacking" to prove its efficacy. This new study does just that. Researchers and advocacy groups alike stress treatments need to be scientifically verified before they can be recommended on a large scale. "This is a good-news story" says Dr. Fred Volkmar, director of Yale University's Child Study Center and an autism expert. "Quite often the [autism] field is splintered," says Brenda Smith Myles, also an autism expert and spokeswoman for the Autism Society of America. "I think on this topic, you will see a lot of cohesiveness." Volkmar says this is a "well-done study, an important study." He says it shows that by effectively intervening at this young age, it is possible to prevent some of the early problems autism causes. Rogers acknowledges that this study is only the first step. "Every piece of science needs to be replicated before it becomes fact, so we are currently doing a replication study," she said. For more information on how to recognizes autism, EDMS and other possible therapies, go to http://www.autismspeaks.org/ and http://www.ucdmc.ucdavis.edu/mindinstitute/.